One of the problems with cargo racks is that they are designed to fit specific vehicles. So when you want to sell your truck and get a new one, you also have to sell and get a new cargo rack. 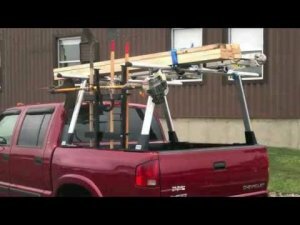 A new system called TransRACK wants to change all that by giving people the option to by a one size fits all cargo rack that they can move from truck to truck. Not only can the TransRACK be adjusted to fit multiple truck sizes, but installation doesn't even require any tools. So how sturdy is a system like this? It is hard to say without actually testing it out, but the TransRACK is made out of aircraft grade aluminum and is rated to hold 800 lbs. The system breaks down into pieces and like I said, no tools required, so I can see the TransRACK as a solution for people that only need a part-time cargo rack. Additional accessories can be added to the rack like a conduit carrier, string trimmer rack, and a tool rack. The Reese Carry Power TransRack will be available at Cabelas in July 2012 and will have an MSRP range of $350-$400. http://www.cequentconsumerproducts.com - Introducing the TransRack truck rack - new from Reese Carry Power. Organizes everything in your truck bed, including tools, your ladders, and equipment. Allows more free space in the back of your truck. The Transrack fits any pickup truck bed and is constructed from strong lightweight aluminum. Features no drill, clamp installation with using basic hand tools. TransRack has an 800 lb load capacity that is evenly distributed.